[S160] New York Times, 4 Mar 1951 p. 91. [S170] Unknown author, Genealogy of the Sparhawk family, p. 34. [S169] Chandler Wolcott, Wolcott genealogy, p. 127. [S83] NEHGR, Vol. 14 p. 362. [S83] NEHGR, Vol. 14 p. 361. [S232] Ancestry.com, Ancestry.com.au Forbes Best Family Tree (Owner: trudibannister). [S117] The Times Newspaper, Feb 14, 1947. [S155] Richard Gookin, Gookin family, p. 36. Francis Marion Adams was born on 4 August 1868 in Pennsylvania.1 He married Mary Myrtle Sewall, daughter of Noah Amos Sewall and Mary Adeline Kuhn, on 28 November 1888 in Bethel, Mercer County, Pennsylvania.1 Francis Marion Adams died on 17 November 1910 in Mantua, Portage, Ohio, at the age of 42. [S107] 1880 US Census, Bangor, Penobscot, Maine. [S149] American Ancestors, , Quincy, MA: Vital Records to 1875. [S83] NEHGR, Vol. 7, p. 40. [S103] Waldo Chamberlain Sprague, Genealogies of Braintree, 11. [S103] Waldo Chamberlain Sprague, Genealogies of Braintree, 12R. [S83] NEHGR, Vol. 136 p. 308. Ian Day Adams MBE was born on 11 March 1923 in Hampstead, London.2 He was the son of Ernest Douglas Adams and Lilias Gordon (Queenie) Fraser.1 Ian Day Adams MBE died on 5 August 2017 in King's College Hospital, Denmark Hill, London, at the age of 94. [S610] E-mail from unknown author to unknown recipient, unknown date "Frederick Appleby. <e-mail address>"
John Adams was born on 8 February 1690/91 in Braintree, Massachusetts. He was the son of Joseph Adams Jr. and Hannah Bass. He was a farmer.1 John Adams married Susanna Boylston, daughter of Peter Boylston and Ann White, on 23 November 1734 in Brookline, Massachusetts. 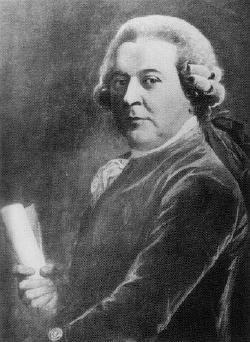 John Adams died on 25 May 1761 in Braintree, Massachusetts, at the age of 70. [S45] Daniel R. Coquillette, Law in Colonial Massachusetts, p. 339. 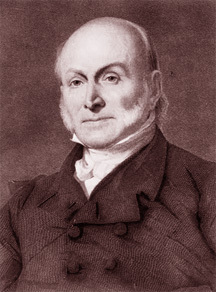 President John Quincy Adams, 6th President of the United States was born on 11 July 1767 in the house standing at the corner of Franklin St. & Independence Ave., Quincy (now Braintree), Massachusetts. He was the son of President John Adams, 2nd President of the United States and Abigail Smith.1 In 1778, John Quincy Adams accompanied his father to Europe and studied at Paris and Leyden and in 1782 went to St. Petersburg as secretary to Francis Dana, the U.S. envoy to Russia. Returned in 1785 and graduated at Harvard in 1787 and became a lawyer in Boston in 1790. From 1794 to 1801, he was U.S. Minister to Holland, Portugal, and Prussia. In 1802 served in the Massachusetts Senate and in 1803 as U.S. Senator from Massachusetts, from 1809 to 1814 was U.S. Minister to Russia and in 1814 negotiated the Treaty of Ghent, was Minister to England 1815-17 and from 1817 to 1825 was Secretary of State for President Monroe whom he succeeded as President from 1825 to 1829. From 1831 to his death in 1848 he served as a member of Congress from Massachusetts. [S34] Unverified internet information, Marriage Licences issued from the Faculty Office of the Archbishop of Canterbury at London 1543-1869. [S75] Frederick Lewis Weis, Colonial Clergy, p. 18.